Limited edition buttercup-colored vinyl includes a digital download card. Shirts are white American Apparel Fine Jersey Tee (2001) with a design by Faye Orlove. 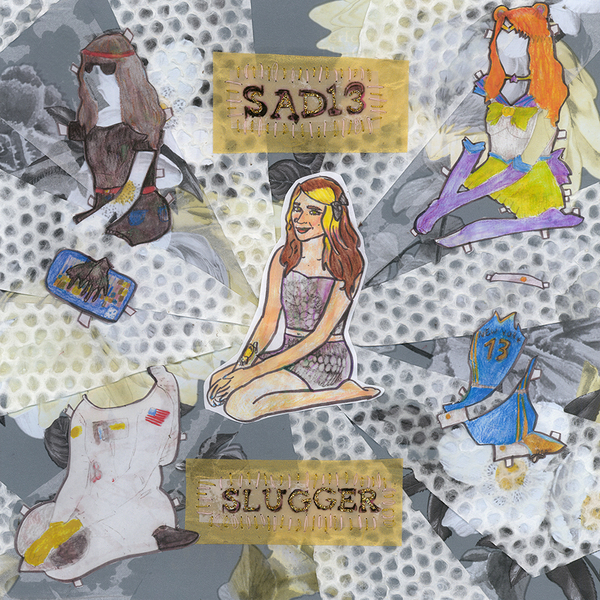 Slugger, the debut LP from Sad13 a.k.a. Sadie Dupuis, prioritizes self-possession in every sense. Sadie, who fronts the dynamite grunge-pop band Speedy Ortiz, forewent her usual modes of collaboration on Slugger, writing and producing the record herself--"to exorcise my control-freaky demons," she says. After Sadie moved to Philadelphia in early 2016, Slugger quickly began to take shape: “I wrote and played and recorded almost all of it in the two weeks I was subletting a friend’s tiny bedroom,” she says. Fittingly, directness, self-determinism, and intimacy are the bedrocks of Slugger’s overall tone. Sadie maintains her dignified wit even in less-than-ideal entanglements, as on the album’s opening track, “<2,” styled to resemble the level of affection of which a heart is capable when it’s been twisted out of shape. “I’m in less than two with you,” sings Dupuis, her crystalline voice steadfastly delicate and assured, recalling self-proprietary forebears like Liz Phair and Fiona Apple. 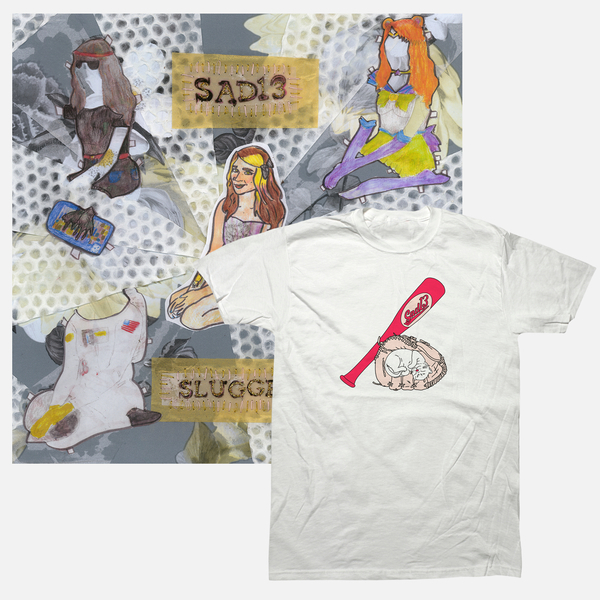 Imitating the reflexive wordplay of Slugger’s lyrics, Sad13’s bedroom recordings are largely about bedroom-based themes. She chews on what it means to give and receive consent, sexual and romantic autonomy, finding new modes of enjoying love and boning after destructive partnerships, shredding joyously past misogyny and other exclusionary gender politics, and so many more exploratory, non-exploitative areas of love. Throughout Slugger, Sadie makes her motives and desires invitingly clear. As she sings on the song "The Sting," “You don’t know how I’d like to say yes”—but she intends to tell you, and to be heard in kind. Slugger--produced by Dupuis, mixed by Gabe Wax (Beirut, Wye Oak, Boots) and mastered by Emily Lazar (Sia, HAIM, Sky Ferreira)--is less rock-principled than Sadie’s other projects, but the talented guitarist makes intelligent work of her instrument throughout the record. The guitar lines are layered with synth melodies written on her laptop and are, occasionally, joined by live drums from Julian Fader (currently of Ava Luna; formerly bandmates with Sadie in Quilty). This matches Sadie’s penchant for bright, tricky assonance and Wilde-style wit, her verses like sailors’ knots tying her instrumentation carefully in place. Her MFA in poetry from—and stint teaching writing at—UMass Amherst are apparent. This is also true of the rapper, producer, and PhD student Sammus’s guest appearance on the album’s final track, “Coming Into Powers,” where she raps, “I’m a star/ I’m a pulsar.” The song closes the loop on a thought ribboning around Slugger on the whole: As Dupuis sings, “I want a life where I can be who I like / Look at me, looking back at me, recognizing who I see.” Slugger identifies an artist and person who, throughout this record, is her own best company.